The protest was in response to a noose, confederate flag and a sign with racial and gay slurs displayed at an on-campus crop science house at the end of an unmarked dirt road off Highland Drive. 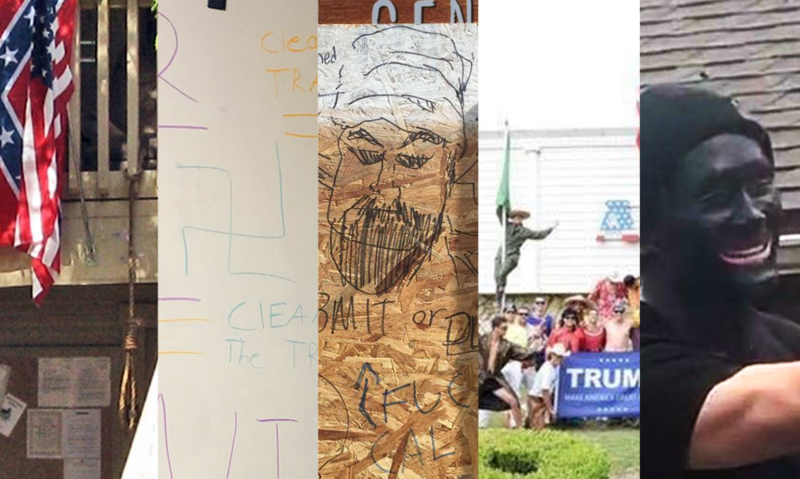 Cal Poly administration cited free speech as a defense for these racist symbols. Cal Poly did not take action against the students living in the on-campus crop science house. Ten years later, Purpura’s statement remains relevant, raising questions as to what, if anything, has changed the campus climate at Cal Poly. In 2008, this display of symbols rooted in hate and bigotry made national news. 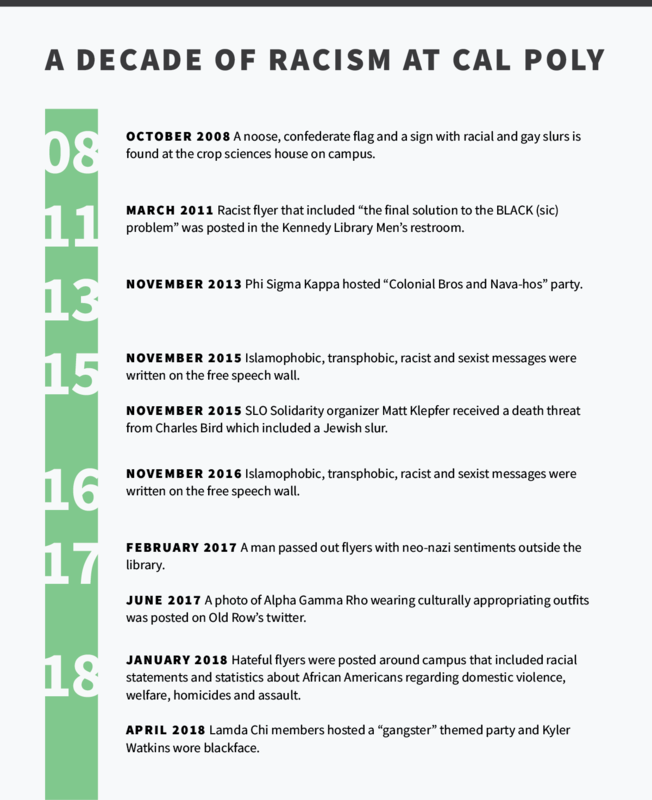 This past week, Lambda Chi Alpha member Kyler Watkins wearing blackface at a gangster-themed party made international headlines and revived the conversation surrounding Cal Poly’s racist history. Lambda Chi hosted their gangster-themed party and Kyler Watkins wore blackface during the same weekend Poly Cultural Weekend (PCW) was facilitated. Photo of minstrel performers found in Cal Poly’s 1915 yearbook. 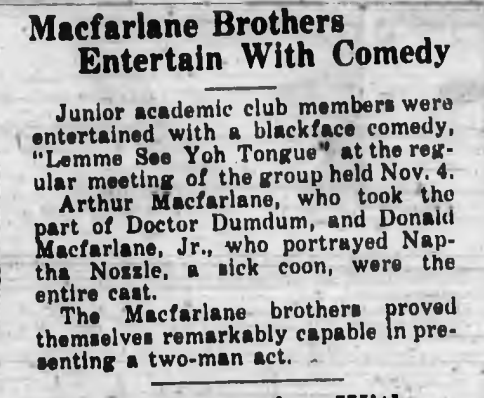 This isn’t the first time blackface has appeared at Cal Poly. 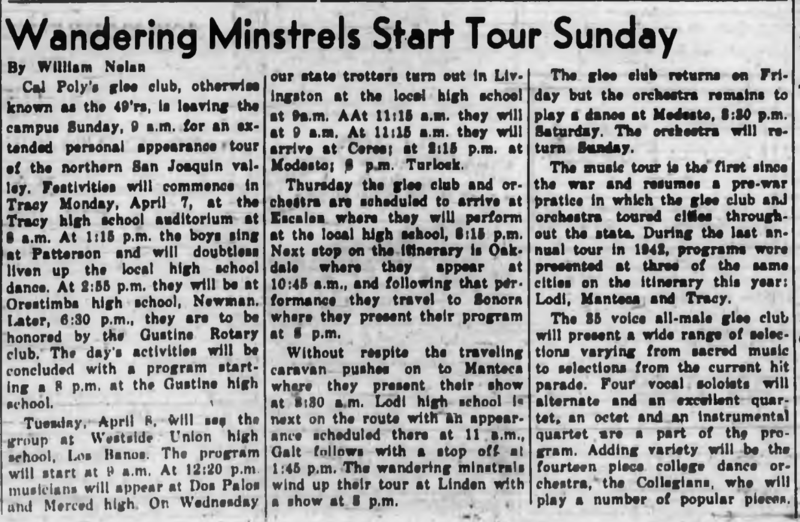 Through the early 1900s, 1920s, 1930s and 1940s Cal Poly students performed minstrel shows in blackface. Blackface was used throughout the 19th century into the 20th century in minstrel shows in which white actors would paint their faces black to mock Black people through dehumanizing stereotypes. Black actors who took part in minstrel shows were also subject to wearing blackface, which further reinforced stereotypes. The museum also notes that the influence on American society by minstrelsy and racial stereotyping cannot be overplayed. 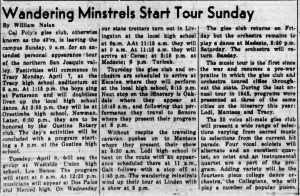 Excerpt from El Mustang April 3, 1947. All Cal Poly students have access to a documentary called “Ethnic Notions” about Black stereotypes and blackface on Kanopy through their Cal Poly portal. 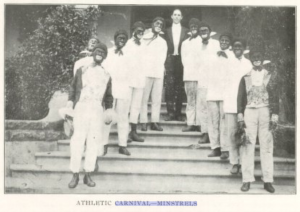 American fraternities at predominantly white universities have perpetuated the practice of blackface in the past. In 2015, Sigma Phi Epsilon fraternity and Alpha Phi sorority threw a “Kanye Western”-themed party at UCLA where students were seen wearing blackface. In 2012, two members of the Beta Theta Pi fraternity at the University of Florida wore blackface to a party. In 1992, Sigma Alpha Epsilon threw a “jungle party” at Texas A&M University in which students wore blackface and grass skirts and participated in “slave hunts,” according to Buzzfeed. In Casey Quinlan’s article “Fraternities Were Built On Racism. So Why Are We Surprised When They Do Racist Things?”, Quinlan explains the foundation and historical context of the development of fraternities in the United States. She references Lawrence Ross’ book “Blackballed: The Black and White Politics of Race on America’s Campuses” to explain many white people’s “colorblind” defense to racism. Excerpt from The Polygram March 2, 1921. At Cal Poly, Phi Sigma Kappa’s 2013 “Colonial Bros and Nava-Hos”–themed party made national headlines. Since November 2015, Cal Poly College Republicans have annually erected a “free speech wall” on Dexter Lawn. In 2015 and 2016, Islamophobic, homophobic and racist messages were written on the wall, which stood for one week each November. Two students were suspended in 2016 for vandalizing a student of color’s bedroom door with swastikas and racial and homophobic slurs in his Poly Canyon Village (PCV) apartment. At the Emergency Town Hall April 9, students of color voiced concerns about the Lambda Chi blackface incident and administration’s lack of action, as well as microaggressions that happen at Cal Poly on a daily basis. Racism in San Luis Obispo is not exclusive to Cal Poly’s racist history. In 2011, an 11-foot cross was stolen from Saint John’s Lutheran Church and set on fire next to the home of a Black family. Three defendants were sentenced to prison for arson and terrorism with additional penalties for committing a hate crime. In 2013, Buffalo Pub and Grill hosted a “White Trash” party which was advertised with confederate flag flyers. In 2015, a “Black Lives Matter” banner was cut down from where it was hanging at Unitarian Universalist Fellowship in San Luis Obispo, and left folded in the churchyard. A new “Black Lives Matter” banner was hung at the church and then ripped down again and stolen in 2016. San Luis Obispo County is less diverse than Cal Poly, with 71.4 percent of the population being white, according to the San Luis Obispo Chamber of Commerce. As of 2016, 56.44 percent of Cal Poly’s student population is white. Since 2008, the white student population at Cal Poly has decreased by approximately 10 percent. In the last ten years, Cal Poly’s African American student population has decreased significantly, by approximately 46 percent. In 2008, the African American student population accounted for 1.3 percent of students while in 2016 the African American student population accounted for 0.7 percent of students. Demonstrate an understanding of relationships between diversity, inequality, and social, economic, and political power both in the United States and globally. Demonstrate an understanding of contributions made by individuals from diverse and/or underrepresented groups to our local, national, and global communities. Critically examine their own attitudes about diverse and/or underrepresented groups. Consider perspectives of diverse groups to inform reasonable decisions. Function as members of society and as professionals with people who have ideas, beliefs, attitudes, and behaviors that are different from their own. In 2010, the Office of Inclusive Excellence (IE) was established within the Office of the President. The IE office was created with the purpose of giving advice and support to the administration. In 2011, President Armstrong pursued a different organizational model for the Office of Inclusive Excellence that focused more on “everyone’s responsibility to address diversity and campus climate issues.” Later in August 2012, the position of executive director for campus diversity was established. In 2015, the Office of Diversity and Inclusion released a seven-year comprehensive plan for 2015-2022 with specific goals and imperatives to foster diversity, inclusivity and a welcoming campus. Some of the goals established include exemplifying Inclusive Excellence in Learn by Doing, Scholarship, Teaching and Learning and enhancing the campus climate. Cal Poly launched the Collective Impact, “a structured form of collaboration that uses a common agenda, in this case of advancing diversity and inclusion at Cal Poly” in Fall 2017. Three strategy groups — curriculum, campus climate and recruit and retain — report to the OUDI to create recommendations by the end of the 2017-2018 academic year. Poly Cultural Weekend (PCW) is another way in which Cal Poly has made an effort towards increasing diversity. PCW was first facilitated in 2004 and aims to showcase Cal Poly’s cultural organizations and resources at Cal Poly to prospective minority students by hosting them for a weekend. In preparation for PCW each year, student leaders dedicate hours to planning and coordinating an entire weekend comprised of activities, tours and performances. According to Armstrong, Student Affairs has doubled the capacity of the Cross Cultural Centers which includes the Gender Equity Center MultiCultural Center and Pride Center. Still, Cal Poly remains the least diverse California State University and was ranked one of the seven worst institutions for Latinx student success as of January 2018. Update: This article has been updated to include the vandalism of a student’s bedroom door in 2016. Update April 17: A previous version did not include Kyler Watkins’ full name in the headline. It has been changed.